We've just about done the Ro24 and the last two groups were highly contested. A chance to see Calm in action after so many years, his games showcased his usual style and reminded us all why he was called Brainy Zerg. He came close to qualifying, almost managing to beat Best. Alas, Best hung on and brought one home for the protoss race to advance in second place. Overall, Mind ended up dominating this group through some stellar gameplay, showing his experience and patience as he dealt with both Rush and Calm. 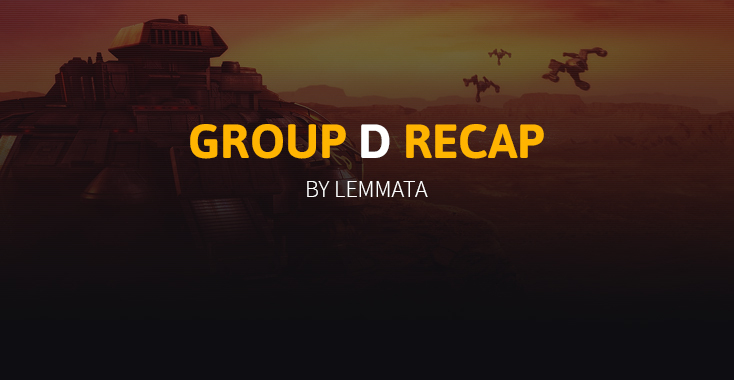 However, group D was the talk of the community this week. Miso stepped up to the plate, beating both Last and Snow, two players that are extremely solid and were thought to be shoe-ins for the Ro16. It's hard to say just how he managed it, considering his extremely aggressive and risky style. Maybe this is finally Miso's breakout? Snow ended up advancing in second place after showing us some pretty ballsy play in the finals' match while both Last and Mong failed to qualify. 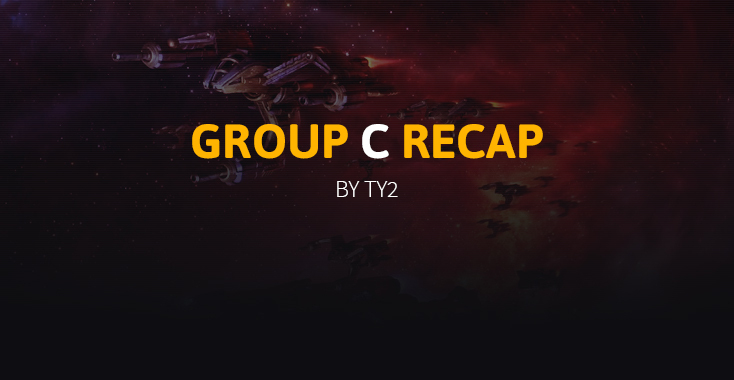 Read Ty2 and Lemmata's recaps of group C and D, respectively for more details! Group E featuring Sharp, Mini, Soulkey and Action is set to start in and has been previewed by FlaShFTW while Group F featuring Sea, Movie, Jaedong and Pusan, previewed by Ziggy will start 2 days after. Let's get hyped! Group C's story of struggle was carried on by the weary wings of two progamers fallen from grace - Calm and Rush. Rush, facing defeat in multiple ASL seasons was back for a world of ferocious competition that Calm, a returning ex-progamer had only cracked the surface of. Rush, with a trying grin, sought to fulfill his moniker,"ASLChamp5Rush," as the fresh faced, pretty boy Calm, would be pitted against Mind and Best. Calm, our friendly brain zerg spawns in the bottom right, and Best spawns in the bottom left. Calm immediately sets to work with a fast overpool and gas, an aggressive fast muta build to catch Best off guard. Best, playing the safe route goes Stargate first. However, the corsairs scout the wrong location in the critical seconds before mutas spawn. In a surprise re-debut, the mighty dohsair make a comeback as an almighty four corsairs fall to the first wave of mutas and scourge. Frantically buying time for cannons, Best only suffers more corsair losses as Calm pangs at the opening that he creates. Calm with the lead confidently techs to greater spire where an almighty combination of devourers, guardians, muta, and scourge seal the deal as the massively behind Best concedes in an upset. 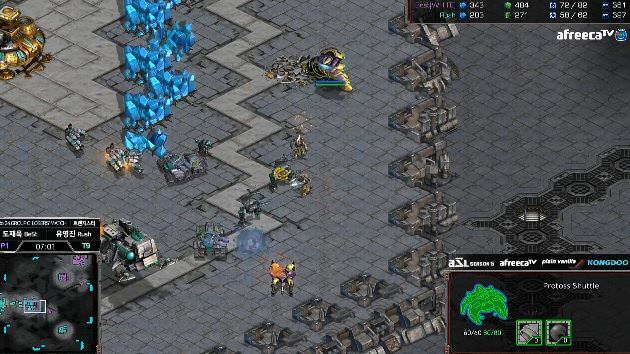 Rush spawns as the red Terran in the top left versus the evenly matched Mind, spawning as the teal Terran in the bottom left. Both players open standard as can be, making a fast expansion into goliath drops. In a matchup of chess turned into nuclear warfare, both players were reluctant to drop. Doing so would open up the possibility of having their main base dropped as both played a game of chicken. Rush and Mind continue to expand and create an increasingly larger dropship army. In a game of trading, neither player can reliably kill an expansion without having their own expansion futilely defended from a counter-drop seconds later. However, one decisive mistake from Rush brings the stalemate to an end - Rush in a moment of opportunity attempts to drop Mind's 3rd, mistakenly thinking Mind's forces were out of position. Mind's defense drop quickly sets Rush's supply back as Mind's fourth base hurtles Mind's economy beyond. Rush, increasingly strapped for money, is unable to expand and keep up with Mind's production. Drop after drop, even with the defender's advantage, Mind's aggression succeeds in killing SCVs and the defending forces. Eventually, Rush, almost half the supply of Mind, concedes the game. Calm, our unexpected winner spawns at the 1 o'clock versus Mind, spawning in the bottom left. In an optimized 2 hatch lair, Calm sets the aggressive tone versus Mind's 14 CC. Calm tries a zergling all-in w/ muta followup, but his zerglings despite not being scouted by Mind, are blocked by a secure simcity. Calm's mediocre muta micro fails to recoup any economic deficits as Mind eventually marches his marine forces to victory. Rush spawns in the 9 o'clock versus Best in the 1 o'clock. Rush opens 1 rax FE versus a daunting proxy robo facility. Best, using a meticulously prepared strategy, begins dropping dragoons into Rush's natural. Rush, unfortunately, had taken a fast hidden 3rd expansion. Without any turrets to fend off the shuttle, the situation becomes increasingly precarious. At the climax of the game, Rush, attempting to nip the bud of the aggression, focus fires the reaver. His decision backfires horribly as his army is destroyed and his factories eventually laid siege to by the growing Protoss numbers. An unfortunate exit for Rush, Best wins. Calm spawns in the bottom left of gladiator and Best spawns in the bottom right. The game opens up with an aggressive three hatch hydra by Calm vs. Best's FFE. However, Best's scouting probe sees this far in advance, scouting the hydra den. Calm, doing a macro followup does an unusual 3 base hive off of 6 hatcheries. Opting for a lurker/crackling/defiler composition, he catches Best's opportunistic pre-hive push in an awkward position. Best, missing his pre-hive timing horribly, is at the mercy of Calm's forces as Calm does a massive defiler push, plaguing and swarming Best's army. Best's supply dangerously plummets as his mineral only 4th base falls. However, Best manages to recoup his losses as he pushes Calm's force back. Calm hilariously lets every single one of Best's dozens of storm drops land as Best's main army pushes Calm to the brink of extinction. Barely breaking Calm, Calm manages to stay in the game w/ a decisive backstab that killed Best's new fourth as reinforcements fend off Best. The game hurtles into chaos as Best's renewed storm drop attempts have mixed success, but still put Calm's fragile economy on hold. Best's now five bases quickly put Calm on a timer as continued drops and more attacks at Calm's exposed natural put Calm impossibly behind. Calm's economy too stunted, Calm goes for an engagement to win the army game but pitifully crumbles. In a hard fought tournament run, Calm ultimately suffers defeat. Mind and Best advance to the Ro16. MisO is one of two zergs who are often known as "cancers" these days. The other is Calm. The implication is that their games are so subpar that the viewers get cancer from frustration. He is a player who mostly utilizes a variety of all-ins. Even in that respect, he is not considered a stylish all-in artist like Shine, but rather a brutish one (hence the "cancer" moniker). On an island map that favors zerg but, nevertheless requires a lot of good decision making, Miso showed off his potential by beating the best Terran not named Flash. Both players chose aggressive openings. Last started with 1-base 2-starport play. Miso opened with a very fast mutalisk build (12-pool gas), perhaps the fastest one. This sort of early game development favors Zerg if it continues into wraiths versus mutalisks. On the other hand, Terran does have a chance to gain an advantage if he defends with turrets at home while attacking with fewer cloaked wraiths. Last chose to go for the more air-heavy continuation, accumulating wraiths and valkyries. He held air control for most of the game with excellent micro despite the fact that Zerg researched +1 air armor quite early. Indeed, Last won multiple aerial battles throughout the game. However, Miso managed to reduce Last's air force just enough to make air-based harassment unrealistic in the presence of spore colonies. The turning point of the game came when Miso briefly lost most of his air units while expanding like a mad man. Last had two potential paths to victory. One was to increase barracks and finish the game by landing dropships at multiple Zerg expansions before Miso could rebuild enough air units to defend all expansions at once. This has a decent chance of working but, it's instant gg if Zerg defends in time. The other option, often seen in sponbangs, is to expand one base at a time and transition to a battlecruiser-based map split. This is a safer choice but, seems to have a lower probability of ultimate success and even some probability of a draw. Instead, Last was overly cautious, investing in a ton of turrets at 1 o'clock. More notably, he even built a ton of turrets at Zerg's 7 o'clock expansion. The turrets delayed his expansion and also the transition to battlecruisers. Perhaps he did not realize how much Zerg was expanding at this point in time. Miso soon reached hive and +3 air armor, at which point Last, having started with a 1-base build and delayed his expansions, could not survive the New Gettysberg level 7-gas Zerg onslaught without the aid of battlecruisers, which were also delayed. Last won every battle except the last but, only the winner of the last battle sparkled with the glow of victory. Mong had been preparing with his former teammate Iris, hoping to take his game to another level like Larva had. Both Larva and Mong were former second-team players with second-rate skills in the SSL era. Between the two, Mong enjoyed greater success and reputation, perhaps thanks to his meticulous study of standard macro play by Flash on standard maps. Over the last year, Larva seems to have skyrocketed into the top echelon of Afreeca players below Flash while Mong has stagnated. Mong had hoped to address this by expanding the range of his play beyond the most standard of standard games. Due to the uniqueness of the new ASL maps, he may have felt pressure to do so. At 5am in the morning on the day of the match, Iris and Mong altered their plans. Iris had a flash of inspiration based on the following idea. On Sparkle, the vespene geyser at the natural expansion is concealed by a psi disrupter. 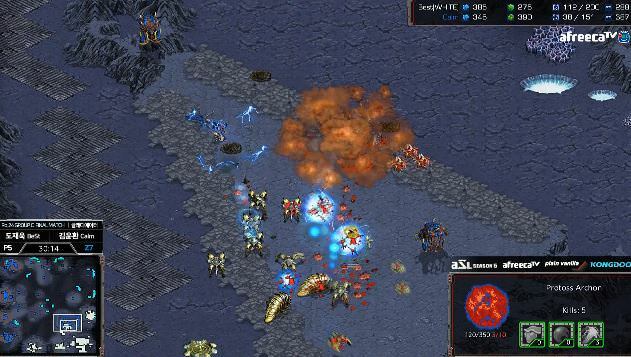 Normally, a fast-expanding Protoss player can mine from two geysers. However, it takes a long time for zealots to knock down the neutral building and mine from the second geyser. This leaves a brief timing when Protoss is extremely weak against a 1-base 8-goliath drop because warping in the robotics facility ASAP is a priority on island maps. This means that dragoon range is delayed. Furthermore, the natural expansion is squeezed into a cramped space, making a drop at the natural impossible to stop. The first part of the plan worked beautifully. Mong made short work of range-less goons and many more probes with his drop and retreated with his dropships intact once a reaver was out to defend. He then prepared to defend against a speed-shuttle reaver drop at his own natural. This was all according to plan. 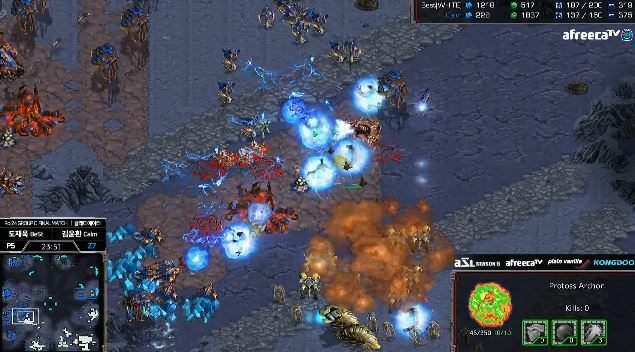 However, Snow's reaver managed to get 10+ SCV kills and escape, equalizing the game. What decided the game was Snow's two-stage reaver drop. The first 1-reaver drop at a Terran island expansion attracted Mong's goliath force. Exploiting this defensive gap in the Terran main, Snow brought a 3-shuttle doom drop with 3 reavers and dragoons. Siege mode was late to complete because of the 1-base aggression but, Mong had a chance to save the game with good micro. Unfortunately, he bungled the unloading of the goliaths he brought back from the island expansion. He unloaded them one at a time in front of the Protoss invaders and the goliaths went...offline one by one. GG. All-in man Miso opened up with 9 pool speed. Jaedong praised this choice as a stylish one even if it wasn't optimal, saying that Transistor is good for Protoss because it is easy to defend after economy-first openings. This means that Zerg will counter by droning hard early but, that is good for Protoss, which normally has to play more conservatively on other maps. The proper Zerg mindset is to not let Protoss do what it wants early in the game but, to force his hand. However, the speedlings did little to no damage while Snow held the ramp. After cleaning up the few lings that got past the ramp, Snow sent a zealot that seemed to end the game by getting 3 drone kills. Miso held on for dear life, but the Protoss seemed to be finishing things off by transitioning to 2-stargate corsairs...or so we thought. 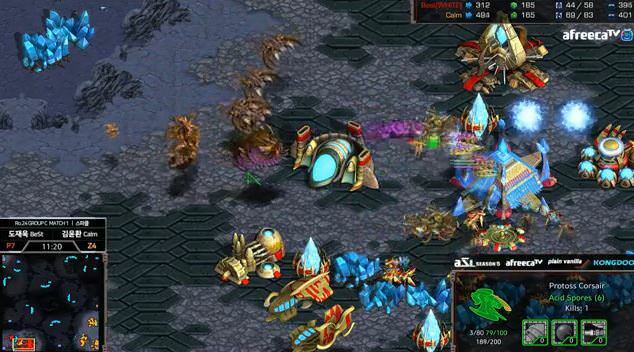 Instead, Miso snuck many lings into Snow's base, throwing the Protoss into disarray. He followed up with overlord speed and a hydra all-in. Having raised the tech tree too fast (reavers and DTs to go with stargates), Snow could not defend properly. Why did Snow choose such a risky continuation when he was already ahead by a lot? It may be that Miso was underestimated due to his poor record in sponbangs. After wrecking two of the top five players by ELO in March, the underdog had the last laugh during the post-game interview as his fans chanted his name. Again, Mong had a well-conceived plan on how to tackle a potential TvT against Last, who started his career as a TvT specialist. The strategy was used by Light with great success against Mong in their private practice games. The plan was based on Transistor's terrain features. The first is the short aerial distance between bases. The second is the two ramps leading into the main/natural isthmus. The third is the large natural expansion area. Mong opened with 2-port wraiths to take advantage of the aerial distance. Two vultures would be made early to attempt a run-by through both ramps. The barracks would reach Last's base quickly and plant itself in a corner of the spacious natural to produce marines. If all went well, it was potentially a devastating 3-hit combo. This plan was conceived with the goal of countering all fast-expand builds. Luck shined on Mong since Last expanded in the usual way. However, Last responded perfectly. One ramp was blocked using sim city. The second ramp was blocked by an SCV supported by bunker fire. The barracks was discovered early and did no damage. Mong still had a chance to do damage with 2-port wraiths but, Last managed to kill them off with ease despite the cloaking upgrade. After losing the wraiths, Mong had to play blind because scans were delayed. At that point, Last opted to take advantage by raising 2 starports of his own to pump out wraiths. Being caught off guard, it was soon GG for the portly Terran. Once again, Last showed off his near-perfect TvT. The final match was a fine example of masterful acting and the thrill of walking the tightrope to make an all-in work. There is a Korean proverb that says that the darkest place is directly below the lamp. Many cultures have similar proverbs. There is an Indian proverb 'Diya Tale Andhera' with the same meaning. Snow warped a forward robo and gateway just steps outside Last's natural. With no need for a shuttle, Snow could get the reaver produced quickly without sacrificing dragoon range. Last's marines came dangerously close to seeing the robo, but never bothered to scout that area, which was a mental blind spot in the same way that the area directly below a lamp is. Some convincing acting by Snow's probe helped keep Last in the dark. After making the initial forward pylon, he pulled the probe to the opposite side of the pylon to attract Last's attention. He sent out another worker to warp in the robo while the initial scouting probe danced alluringly in front of Last's marines, beckoning them away from the hidden buildings. Once the reaver made its way out of the shadows and busted the bunker at the natural, it was GG. 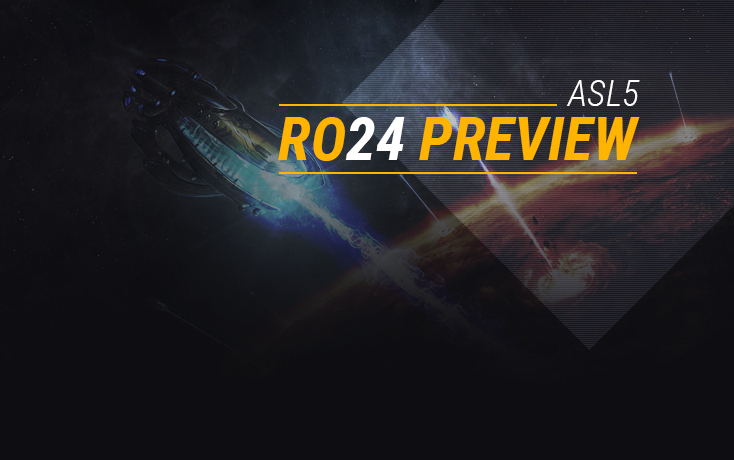 Caught totally off guard, the best Terran not named Flash was summarily eliminated in the Ro24. After failing to qualify for the wildcard spot, and even faltering a bit in the qualifiers, Soulkey is back and ready with a vengeance. Sharp, the previous runner-up in ASL1, looks poised to lead a potential comeback. Mini, the continual thorn in the side of the S-class players looks to raise more hell on players like FlaSh. Mafia Zerg, Action, looks to lead his gang back into the starlight after managing to climb through qualifiers in his first ever ASL. With 2 Zergs in the group and more Sparkle games to come, who will advance out of this hectic group to advance to the Round of 16? Zergs are now 3-1 on this map, including convincing 2-0 performances over their Terran counterparts. The ability for Zerg to stay alive during the period where Terran simply dominates the sky with wraith/valks while slowly expanding across the map has given Terran many issues. Perhaps players need to look towards someone like FlaSh, who heavily utilizes MnM drop play after the wraith/valk mid-game to stop Zerg rather than being stubborn and continuing to bash their heads against the Zerg air deathball. Sharp should have studied these games closely to understand the potential weakness that Terrans have in the late game, and made adjustments accordingly. Then comes the Mafia Zerg. Action has… well, been out of action for a fairly long time now, but he’s still a considerable threat, especially when he hits hive tech as mentioned in the Power Rank. Especially on an island map like Sparkle, expect Action to be potent with his late-game ZvZ. Expect a continuing trend of dominant ZvT play on this map. Mini’s first match comes against the second best Zerg in the world right now, so do expect him to elevate his game against Soulkey. That being said, with all the changes to Sparkle to help Zerg, Soulkey should still have a relatively easy time on this map. He’s got all the necessary air micro skills to be able to crush Mini’s air fleet, and his creative play during KeSPA era with queens should lend itself nicely to this game. As long as Soulkey can prevent the mid-game reaver drops with good scourge control, he should be able to expand across the map and easily take this game. I’m not quite confident in Action’s ZvZ. His ZvZ was by far his worst matchup in the KeSPA era, sitting at a measly 46%. I expect Action to go for some sort of 2 hatch ling all-in, attempting to use both ramps on Transistor to his advantage to crush Soulkey early. But, Soulkey should be aware of this due to the close-by-air distances at all of the naturals, and he should notice Action’s low drone count. Expect him to do some incredible drone drills to hold off the all-in. So far, both games of PvT on Transistor have been quick, weird ones. Light went for a weird 3 rax marine-scv all-in against Shuttle and BeSt crushed Rush with reavers against Rush’s weird proxy 3 base. That being said, Sharp’s TvP is by far his worst matchup, and Transistor is a weird map to play, as the center looks better for Protoss while the side attack-paths look better for Terran. Overall, with reaver play always a possibility on this map, Mini should be able to take advantage of the close-by-air distances to gain himself an advantage. Not only that, this map allows for either carrier or arbiter play so Mini will have his choice of which route he’d like to go down. Neither Action’s ZvP nor Mini’s PvZ are exceptional. Still, the ZvP matchup is difficult for Protoss to figure out, especially considering that not a single Protoss since Bisu has a winning record against Zerg in the post-KeSPA era. Gladiator is still not a bad map for Protoss, with a close mineral only 3rd, and a relatively good 3rd gas for Protoss to get launched into the late game. The reverse ramps don’t help Zerg either for the 4 base setup, which is why most Zergs end up taking the closer high ground 3rds. If Action doesn’t try a 3 hatch hydra bust, I expect Mini to take this with his solid macro. Soulkey and Mini to advance to the Round of 16! During the Bisu vs Jaedong showmatch at BlizzCon 2017, the Tyrant announced that he might not get another chance to compete in a tournament overseas. It seems like there's a forum post every other day about JD having to go to hospital to get his wrists sorted. All those hours practicing like a machine are finally catching up with the Legend Killer. Retirement is inevitable. But, not before getting another shot at glory. With 3 OSLs and 2 MSLs under his belt, Jaedong is running out of time to pick up an ASL trophy. The most immediate threats on the horizon are Sea, Pusan, and Movie. Let's break the group down then, shall we? Funnily enough, all the players of group F, save for Jaedong, missed out on ASL4, either not qualifying or, in the case of Sea, failing to keep it together whilst tanked up. Taking some time off to reevaluate the situation, it seems like Sea has decided to transition from a StarCraft-oriented personality to an entertainer, who's more keen on streaming idle banter than actual games. Has that affected his skill? Most likely it has. And for that reason, I do not expect Sea to actually make it out of the group on Tuesday. Don't get me wrong, I do not wish to witness the downfall of another StarCraft pro, but with the current state of things, that might just be what's in the offing. Being one of the most consistent players of the SoSPA era, Sea also had a bunch of outstanding runs in the early seasons of the KSL/ASL series, with a semi-final finish in ASL1 and a loss to Flash in the finals of the following season. I honestly hope he bounces back. Pusan is the oldest player ever to compete in the ASL. At 33, the Protoss might as well be the oldest player ever to compete in an actual StarLeague. Losing to Sacsri in the Seoul qualifier, Pusan did not attempt to compete again in Busan (ehh...), instead choosing to travel to Gwangju, where he beat Killer to qualify for ASL5. Although his adversaries in the group stage are not necessarily young either (in terms of e-sports at least), I just don't see him keeping up with the pace of the competition. StarCraft needs new blood. As much as I respect Pusan for still being able to remain somewhere near the top, a tricenarian making it into the Ro16 of the ASL does not seem healthy for the scene. been, this group is not going to be about experience or skill. This group is going to be about one's resolve to make it into the Ro16. Is Movie's will as strong as that of Jaedong, Pusan, or Sea? For his sake, I certainly hope it is. The Tyrant. The Legend Killer. The God of Destruction. Jaedong. He tries, and tries, but just can't make it in the ASL. Making his debut in ASL2, Jaedong made it all the way to the semi-finals, where he lost to Flash by a close 2-3. After that, things started to fall apart with frequent visits to the hospital. Playing through the pain, only to lose in the Ro16 of the two seasons of the ASL that followed. Just one more, Jaedong. This is your season and, then you can rest. I can't imagine what it must feel like, having to give up doing what one loves. And I hope I never learn firsthand. But all the draconic training regimen and strenuous practice patterns during Jaedong's prime are finally taking a toll on his body. Yet, despite all that, Jaedong is not slowing down. Not yet. Not before he's crowned champion. Jaedong and Movie to advance to the Ro16! If these predictions hold there will be only two Terran in the round of 16, the rest an even split of Protoss and Zerg. 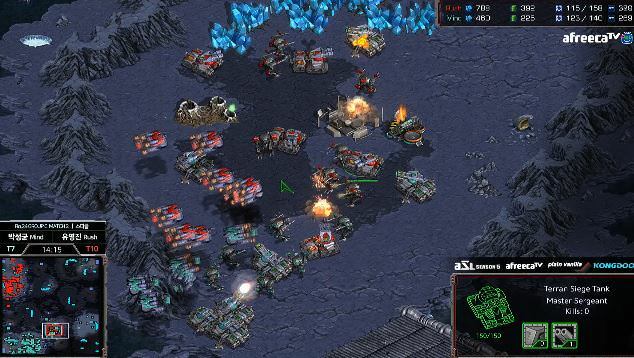 Is ASL5 really is an attempt to dethrone FlaSh by using difficult maps for Terran? Or is tesagi really just FlaSagi? It's more Flash being good at whatever they throw at him, rather than actual tesagi. It'll be interesting to see if these new maps, including Third World, can stump him or if he'll just continue winning. Hopefully, he faces strong protoss and zerg players. No TvT vs Mind again please! Even on Third World FlaSh has gotten a lot better from what I have watched, so I fully expect him to overcome even that! Got to disagree somewhat about Pusan though. Sure BW needs new blood, but I think it's quite exciting to have an old player come back to compete with the young. What we really need is a young talented player to take down Flash- I think BW would be officially dead if this never happens. Also even as a Protoss fan I wish JD wins this one. And conditions aren't at all bad- Protoss maps actually give a chance for Flash to lose to Protosses. I think it's more likely that Terran is overpowered... in maps like Fighting Spirit and Circuit Breakers that prioritize optimization. This may also be why Stork is doing so well these days (other than the gf buff)- he excels in strategic maps due to his deep understanding of maps. My prediction is that Sharp beats Action on Sparkle with a weird build and loses to a web-goon build against Mini in the final match. Based on nothing. Quite weird predictions for sparkle. People think zerg is now favoured against protoss on sparkle? I don't think that's true. Both Soulkey and Jaedong will have a hard time in that first game, Soulkey more so than Jaedong. I also think that Sea got decent chances to advance out of his group because Movie doesn't seem to be on top of his game atm. I can't believe people are still falling for the brain zerg meme in 2018, literally the worst possible nickname for him. Add one word and it still works. Brain cancer zerg. Brain dead zerg. etc. The variations are endless. Go kickass Jaedong. We are all rooting for you.